Built in gamepad support!! Just plug it in and push a button, you should then see a little SNES icon in the bottom right corner. Have fun hopping, bopping, slashing, and smashing. Yeah! Did you guys put on the Sac Indie Arcade? I was there twice, it was super fun. What is the event in Fall? Hello, i hope it's not dead as it was really promising, could you confirm it ? This is a bit embarrassing but I sent that last comment before I finished the demo. I would like to clarify and add a few things. One, I could not *always* fight through walls, but it happened a couple times? The enemy had to have Noticed Frauki first. But most embarrassing, I quickly discovered that one COULD jump down through platforms, I had just been trying it in the wrong places. So my apologies there. Thank you so much for the feedback! I like the idea of changing the music for the fights, I'll experiment with that. I know you still sometimes get pushed through the geometry of the level, thats been a thorn in my side for a long time. But I will get it sorted out. I will also try and make the platforms you can drop through more distinctive and consistent. If it wasn't clear to you, it's a problem with how its presented. So I will try and tighten that up. Also, once I finish the map (its nearly done as of now), I am going to go through and fix a lot of the annoying or finnicky or overly precise jumps. Those are annoying. Thanks again for the feedback and for trying out the game! Can I just say, as great as this is, it could use more diverse music (i'm thinking music for the 'samurai' battles since they seem to be minibosses, would be great to get a tone shift in the music). Additionally, I did notice in my playthrough, bugs you said you fixed? I could fight through walls and ceilings, I got stuck in a Secret Area under one of the first enemies, and it still needed checkpoints. I liked the flying enemies, and the diverse attack types! Wish the jumps, and especially the wall jumps would be less precise. Loved the flavor text! 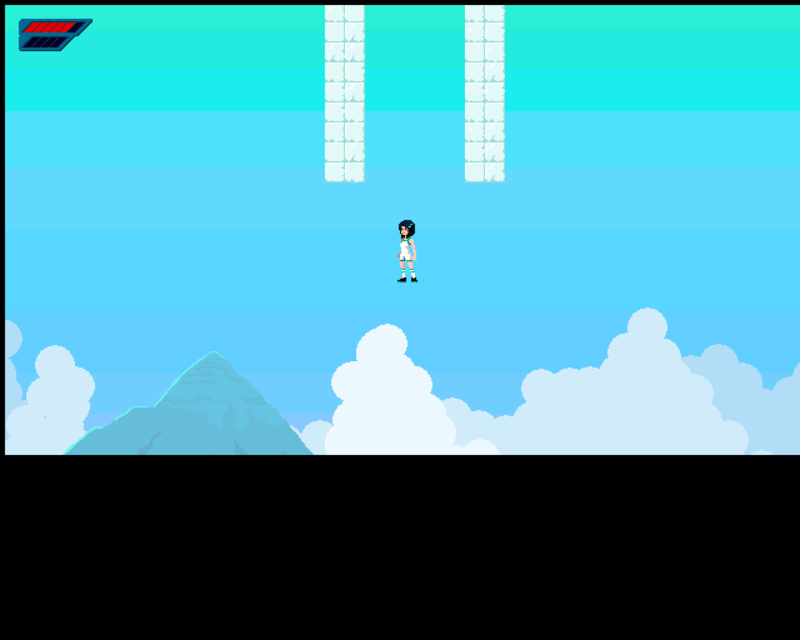 Humor reminded me of Level Up!, a fairly well-made browser pixel game. Final little nitpick-- in most games of this type, one is accustomed to dropping DOWN through thin ground. Sometimes there would be thin platforms that you could jump up through, but you could never go back down that way? Would be less inconvenient if it weren't for the aforementioned lack of checkpoints. All in all, an excellent start, lovely graphics, can't wait to see the full game! This is really good, looking forward to playing more advanced versions in the future. The only suggestion I really have is to give the enemies that do a million points of damage a better telegraph before they attack, even if they're supposed to be hard and screw you over on purpose, and some of the jumps are a bit too precise, requiring you to get the absolute top pixel apex of your jump to be able to reach. Hi, posting this here in case you haven't seen it yet. I'm liking it! Combat is solid, but I really don't like the constant slow motion on hit. I feel the player's attacks have a bit too much cool down, it makes the combat feel a little sluggish, especially when multiple enemies are around. All the different moves protag has are cool. I like the way the enemies behave, jumping around and dodging the player. The flying enemies weren't too fun to fight for me. The mosquito always hit me after I hit it, unless I spaced my attack perfectly. The flying squid thing flies in out of nowhere with no telegraph at all. Samurai can just be jumped over and ignored if his death doesn't open a door. I like the look of the world. 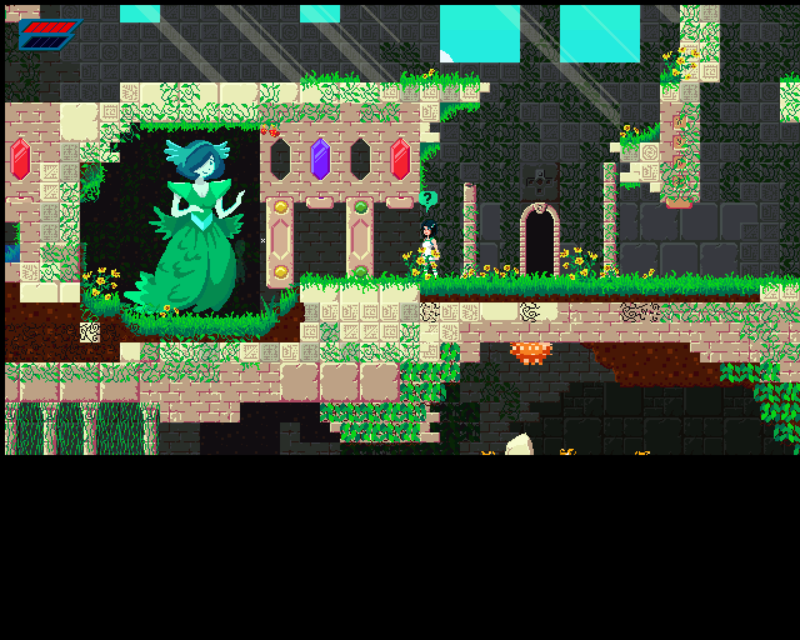 Good colors, good tilesets. Music would really help make it super moody, and could also be an indicator for the different sections of the world. Everything is kinda intertwined and I'm not sure how I would describe different sections to my friends. "Pipe world", "white block waterfall place", "underground." I felt most of the messages the player could read are kinda pointless, like "o no the ground is wet my socks are gonna get wet : (." They don't really reveal too much character or lore or anything, and its kind of a weird comment to make after killing a bunch of weird pink robo samurais and orange mutant things. The mushroom drug effect was kinda annoying and felt totally pointless, but maybe you'll make use of it later. Watching protag die takes two times as long as it should. No idea what picking up the orbs does, but of course I picked them up! There's a few parts of the game where dying means walking 5 minutes back to where I was. Checkpoints Dark Souls style are probably the way to go, but I do think having only shortcuts would be cool if you can pull it off. Tiny thing: protag's roll has that smear effect, which looks cool, but its not used anywhere else in the game, which feels a little weird. Attacking through walls lets you kill a few of the enemies and cheese some fights. A settings menu is probably gonna have to be the way to go. Having no way to pause the game is pretty weird. Editing a text file isn't something most people are gonna want to do. All in all, really good!!! It's a good looking, enjoyable experience, with a good amount of challenge. I'd love to hear some music in the game!! Thanks for trying it out! And great feedback. I'll reduce the slow mo effects, and the death time. I can see how that would be annoying. I might make the flying bug have one health, and add a telegraph to the spore monster with some flashing red maybe. Samurai should usually have a door. But I can also give him an attack if you try and jump over him. Messages are currently pretty random. Once I finish the geometry and polish the world up, I'm going to do a pass where the history and character of the world and Frauki are elaborated. Then the messages will be more coherent. But I do like when she says random silly stuff :) I think of it a bit like flavor text. Orbs use is a WIP. I've tried a bunch of things but nothing has quite felt right. They can't really be gating anything important or the player will feel compelled to farm them. Most simple is just a DKC banana situation. Probably going to end up adding a few checkpoints. Only shortcuts was my goal but I'm not sure if its possible. Which parts had you running 5 minutes? No problem dude! It was fun! The music you posted is solid chiptune! But I will admit I was kinda expecting something sounding like Hyper Light Drifter, with lots of soft pads and a little of a serene feeling. Staying 100% 16bit is admirable though, and that songs works well for some of the underground sections. I was exaggerating about the 5 minutes thing, but going to pipe world the first time around takes a good amount of time. Adding more lore to the text would be perfect, especially interspersed with Frauki's observations/narration for some personality. But he was having a lot fun! He just wished he could rebind the controls or that he had his gamepad lying around. Great stuff dude! Glad I could give feedback! Since edited posts won't notify, death screens also take far too long. Your game could also use some more checkpoints despite the shortcuts, at least in the demo. Getting down to the sewer levels from your original spawn is a long road. Game really needs a settings menu where you're able to configure keybinds, sound volume and graphical settings alongside action shortcuts like pressing down-forward quickly enough results in a forward roll despite already having an assigned key, namely X. The tutorial seems pretty straightforward if you're playing on a controller. I was kept wondering just a tiny bit on what kind of cryptic key combinations I had to pull off on my keyboard. If you're going to release this game you on multiple platforms or even just PC with controller support, you're better off changing your game to modify itself on the fly (detecting a controller gives you a tutorial with the former's controls inscribed on the wall), or the easier and most likely the one that makes more sense is to make it universal by calling it by name. You can even make the current bound keys/buttons pop-up whenever you're near those(they're still blending in a bit so maybe the 'sparkles' you use can apply and you transcribe it by first/third-person text), this does apply to text too (right shoulder button to eat an apple). I'm liking the game's look and of course the protagonist. Gives me a vibe of Fortune Summoners and I'm sure your game could benefit from it, it so to speak has sort of a 2D fighting game combat with platformer elements plus you also get to be a cute girl. Maybe this could override your decision to include(?) a global attack timer. 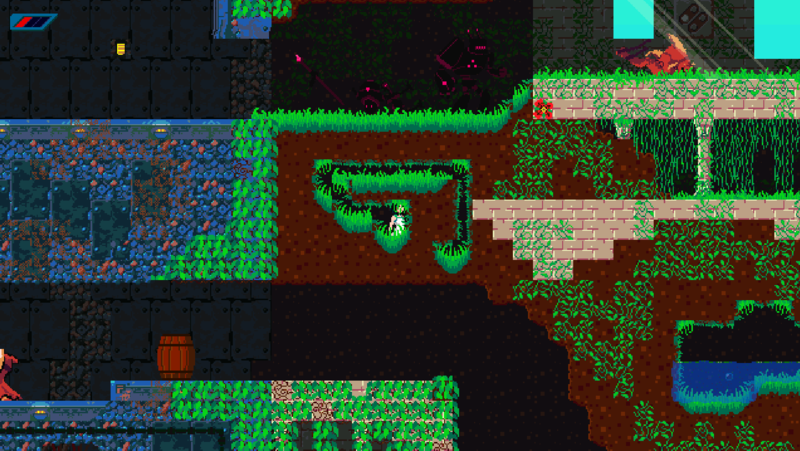 Enemies can be hit through obstacles/walls and thus easily cheese them out for no risk whatsoever. Doors requiring a gem don't seem too receptive, it's a bit finicky for it to activate and I usually have to circle around being point-blank or 2 steps away until it opens. Can also roll through a door while it's still opening. After quite some time, Frauki is unable to jump down from a platform. Slow-motion effect on either getting hit or delivering a hit gets annoying with time, please add an option to disable it. Roll-stinger seems to be the end all be all option when it comes to combat, completely nullifies any incoming attack, but I'm iffy if you should actually nerf it as it's one of the better options against Hayabusa and his 3 meter long katana that he only unsheathes whenever he sees Frauki. There's nothing to indicate you already have an apple at hand, leading me to sometimes waste apples. Took the wrong door, leading to an empty pipe alongside another pipe of water to an near-empty area and a place to jump off to the end of the world. This should've been blocked. Seems like I did really reach unfinished areas, aka the 'end' of this demo as I just got to a full white blocky area through a water pipe. On another note, the samurai cannot hit one single step below him so here's the webm. Don't think I was meant to be here yet, but I managed as I fell down from that white world and got the purple crystal. Kind of broke the crystal collecting order like this. Seems to be it, I've reached the end of the demo. Can't seem to find any more areas that can be unlocked and the rest are unfinished. Thank you so much for this detailed and useful feedback. I really appreciate the time you spent to go through it all. Below I'll respond to your points, and then ask a few questions if thats ok.
Rebinds are coming. The game is currently menuless, and I'd like to keep it that way if possible. So this might involve editing an external file. Is that too tacky? Roll is X, down -> forward, or double tapping forward. I thought having a few options would be cool. In MMX you could dash with a button, or double tap forward. Maybe down -> forward is not needed. I have a plan to replace the background cues, depending on if there is a keyboard or a gamepad, prioritizing the gamepad if its plugged in. I think the game works way better with a gamepad. Having additional text prompts could be a good idea. The global attack timers is in, but its set at about 300 milliseconds right now. Tried it longer and it made things too stilted. Working on a fix to hitting enemies through walls. Only complication is that I need to make sure that it doesn't cause a "miss" when there should be a hit, because there is a little corner in the way or something. Graphical cue for shard doors is bugged right now. It should have a small shard come out of the player, grow to size, and then slot into the door. Will fix it. I intentionally let players roll under half open doors. I thought it kind of makes sense, you can roll through narrow passages. Does it feel weird? Not sure what you mean when Frauki can't jump down from a platform? I'll tone down the slow mo effect, and add an option. A lot of enemies can counter the roll-stinger. Unless you dodge them first, then use it or something. Were you able to just blast the samurai with it? Been going back and forth on checkpoints. Probably a good idea but I had a kind of idea that everything would be shortcut systems. But as you keep going, it will always get longer and more annoying. Did the size of the world feel too small? I still need to finish the white stone area, the cave area, and the big metal tower. Plus, only a small section of the game has its full complement of enemies and stuff. How long did it take you to get through? I'm hoping for about 5-10 hours of gameplay in the finished thing. With a higher density and more carefully implemented encounters, does this sound reasonable? Did falling down through the world and looping back to the top make any sense? My plan is that the final "shortcut path" will be to start climbing up that tower, instead of going down. Did you find any of the health upgrades or anything? >The game is currently menuless, and I'd like to keep it that way if possible. So this might involve editing an external file. Is that too tacky? It won't really fly as it's a basic function of the game, but you can sort of make a pseudo in-game menu in the starting area that you always teleport back to on death. Now as to how, unfortunately that's your problem. One of your fellow developers made an interactive menu as part of his game, 'Bun Escape [RESET]'. It's pretty neat in function and design. Figuring you could sort of do it in game like some sort of speech bubble with control settings and so on, tie it next to the fairy, whatever your plan may be. >Roll is X, down -> forward, or double tapping forward. I thought having a few options would be cool. In MMX you could dash with a button, or double tap forward. Maybe down -> forward is not needed. It's fine to have options and it'd be better to let the player decide if he wants a proper keybind for rolling or if he wants to enable a shortcut through the settings menu for rolling which is activated by pressing down-forward quickly. As it stands I tend to get rolls when I want something else, be it looking down and moving forward or whatever. Give the player his choice. >The global attack timers is in, but its set at about 300 milliseconds right now. Tried it longer and it made things too stilted. With roll-stinger actually being pretty decent, global attack timers might not be necessary as I told you, but alas. >Working on a fix to hitting enemies through walls. Only complication is that I need to make sure that it doesn't cause a "miss" when there should be a hit, because there is a little corner in the way or something. 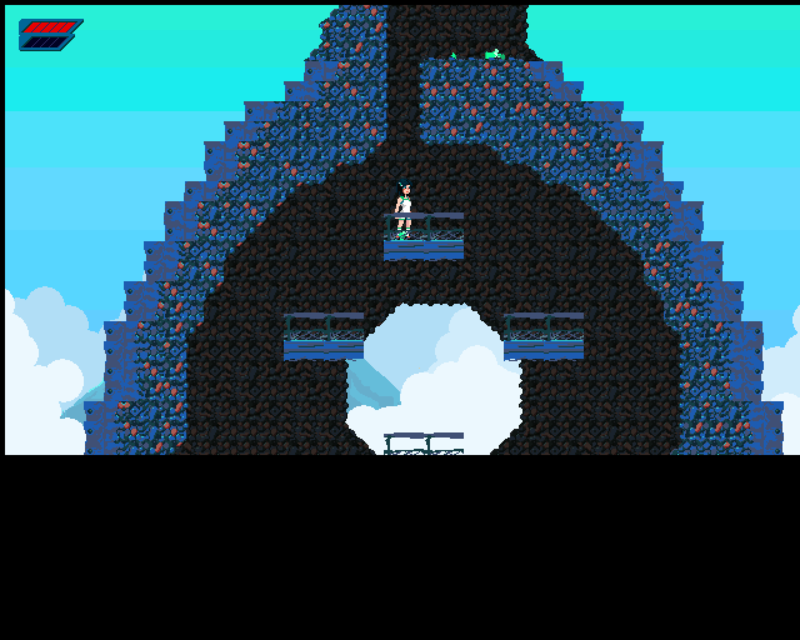 Unfortunately I can only advise you visually and the way it'd be would be most likely complicated that would somehow involve making platforms different types of wall when considering sword collision(so as to let them through at least). You're going to have to take someone's else spin and make it your own. >I intentionally let players roll under half open doors. I thought it kind of makes sense, you can roll through narrow passages. Does it feel weird? It's only weird because I can roll while it's still in the process of opening, you can't even call it half-open and only maybe a gecko could go through. You can speed-up the door opening animation for a fix, though. >Not sure what you mean when Frauki can't jump down from a platform? Sorry, I actually found out it might be related to getting hit by those flying creatures that daze you and the effect you obtain when going near certain mushrooms as well. I didn't update it and forgot about it later, but I think I died with the effect still on and I couldn't descend any platforms so I just wrote that down and restarted which fixed it. >A lot of enemies can counter the roll-stinger. Unless you dodge them first, then use it or something. Were you able to just blast the samurai with it? Samurai takes a dodge because he's almost always in a parry/block-state until he preps his attack. Rest can be killed easy, depending on situation for the maybe sole exceptions(besides sentries due to their position) the scythe wielding frog as he'll brush off any hits until he does his own attack, maybe I can hit him while he's mid-air, mid-attack. His katana hitbox too, please. >Did the size of the world feel too small? How long did it take you to get through? Unfortunately it felt a bit padded due to the far away checkpoint system but I really can't give you a rough timer. I multi-task as I play the game, be it reading the thread, comments and reply on this page and so on. Plus when I'm also writing my comment I try to make sure I can reproduce things and to keep it accurate. So I'm re-playing demos as I write my feedback. World size felt pretty decent but I'd expect bigger if you do implement checkpoints and 'better' shortcuts as written above - spawn to sewer level- type of things. Recording and making webms all takes time into account which I, myself, do not time. 2-5 hours and read this value knowing what I've just written above. >Did falling down through the world and looping back to the top make any sense? My plan is that the final "shortcut path" will be to start climbing up that tower, instead of going down. It's not common, but it can make sense if justified well enough as with all things. If you take a look at the Dragon's Dogma cut content and concept art, they had a tower that was fairly similar in concept to yours, so it wouldn't be much of a problem. They just had little budget and no time. >Did you find any of the health upgrades or anything? I thought it showed in my screenshots, I have five health bars. Basically I collected all in-game that can be collected through normal means. I know there's one locked between multiple walls in the sewer pipes. Also as someone said in the thread replying to you, any sign notices regarding whether or not I'm treading through unfinished areas would be great, for all demo runners really. I get to know how much content is up and if missing areas are a bug or not, between those lines. Here's my question this time, you're the only one to follow me, why? Everyone including you were to be 'picked' up eventually as I went through my collection. Is there a way to block enemy attacks? since otherwise you would be doomed if you are trapped in a pit with an enemy and have no energy left to attack.